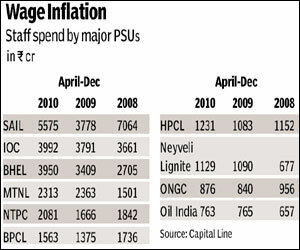 Public Sector undertakings (PSUs) staff spend increased by 15.6% during April-December 2010. This is revealed in a study of 53 PSUs (central and states, but excluding banks and NBFCs) for the periods, April-Dec 2010 and April-Dec 2009. The higher staff cost (R30,883 crore) in the current financial year comes against the backdrop of a 5.3% fall in employee expenditure in April-Dec 2009 to R 26,705 crore. The total expenditure of these PSUs was also higher this yearup 21.6% to R 6.84 lakh crorecompared to an 18.8% decline to R5.62 lakh crore during April-Dec 09. The staff cost-to-total expenditure and staff cost-to-sales increased from 4.07% to 4.51% and 3.75% to 4.01%, respectively, for the nine-month period in the last two years. Among the PSUs, the highest increase in staff cost was seen at Gujarat State Petronet,where it rose 105.7% during April-Dec 10 from a negative 15.7% during April-Dec 09. The companys sales increased from R734.08 crore during April-Dec09 to R783.95 crore during April-Dec 10. (Sales were at R355.52 crore during April-Dec 08). The company's net profit growth decreased from 245% during April-Dec 09 to 16.3% during April-Dec 10. For FACT, the staff cost grew 22.7% during April-Dec 09 and 56.2% during April-Dec 10. FACT had a staff cost of R90.16 crore during April-Dec 08, which rose to R172.80 crore in April-Dec 10. In April-Dec10, SAIL had the highest staff cost of R 5,575 crore followed by IOCL (R 3,992 crore), BHEL (R3,950 crore), MTNL (R2,313 crore )and NTPC (R2,081 crore). SAILs wage cost was up on account of a revised wage structure. As we have seen, the staff cost to total expenditure ratio of PSUs increased during the study period. Among the 53 PSUs, a steady increase in the ratio was seen in the case of 19. Mention may be made of MTNL, BEML, NHPC, SCI and Hindustan Copper. The staff cost to total expenditure ratio of Hind Copper almost doubled from 18.48% in April-Dec 08 to 34.77% during April-Dec 10. Similarly a steady downward trend in the ratio was seen with seven PSUs. Mention may be made of NTPC, Engineers India, NMDC and MMTC. The staff cost-to-total expenditure ratio of Engineers India steadily decreased from 35.21% during April-Dec 08 to 25.24% during April-Dec 10. An interesting aspect is that nearly 17% PSUs had reported a decline in staff spend during April-Dec 10. Significant decline in staff cost was registered by GAIL, MTNL, Mysore Paper, Scooters India and PTC India.